Is your Miele Dishwasher displaying an error code? 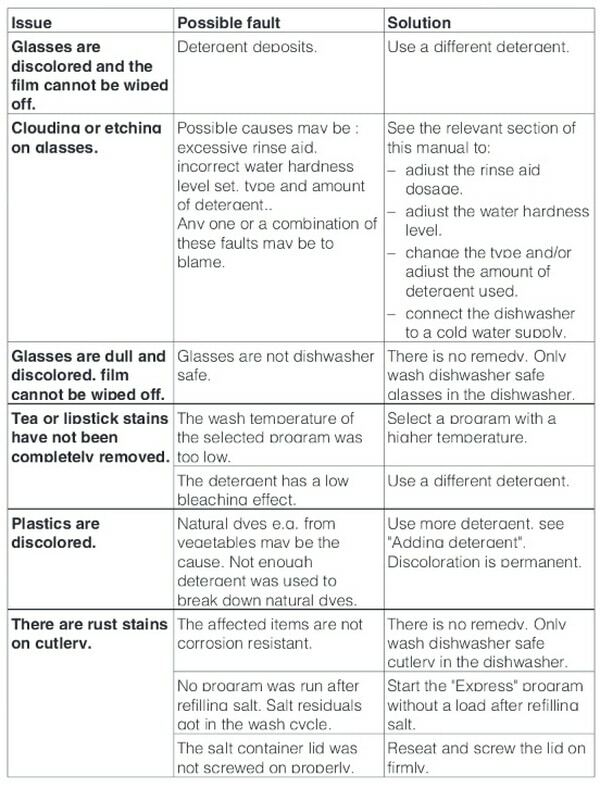 Certain style Miele Dishwashers have built in diagnostic systems. If your dishwasher detects a fault or error in the system, it will show an error or fault code on the display. 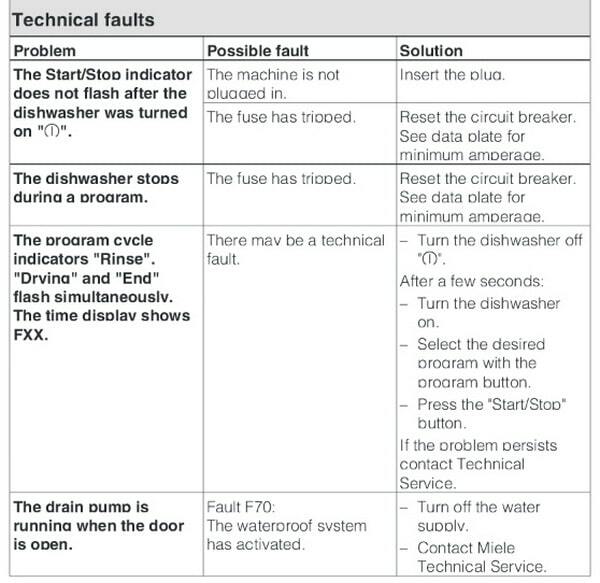 When an error code is displayed, your Miele Dishwasher is telling you a specific fault. There are many different model numbers of Miele Dishwashers with digital displays so if you see an error code write down what is flashing or displaying. Don’t pull the power from the dishwasher if it shows an error code. If you pull the power plug it will erase the fault code but will not fix the problem. If the error or fault is not fixable by you, it will require a repair technician if you cannot do it yourself. 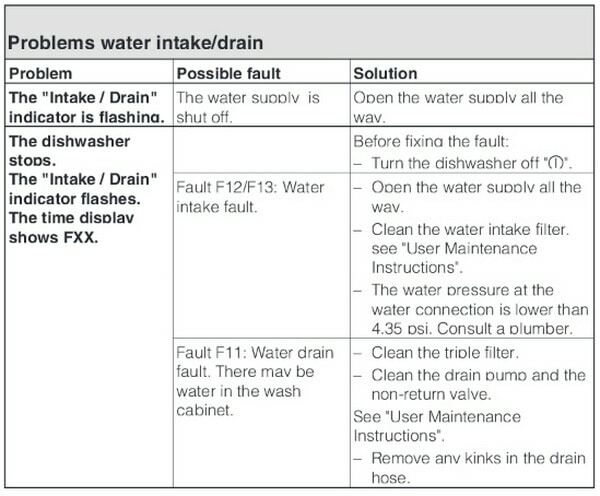 Miele Dishwasher Error Code = Fault code F11 (Drainage) = Water not draining away. Cause Of Error/Fault Code = Filter combination in the cabinet is blocked. 1 – Clean filter combination (refer to manual or online video). 2 – A piece of glass could be blocking the drain pump. Remove the object. 3 – Drain hose kinked or clogged. Straighten hose. 4 – There may be deposit buildups in the drain hose or the drainage system. Check the drain hose and drainage for blockages and clean. Miele Dishwasher Error Code = The display shows fault code F12 or F13 (Water intake). Cause Of Error/Fault Code = Stopcock is closed. 1 – Turn on the water supply at the stopcock. 2 – Water inlet filter is clogged. Clean water inlet filter. 3 – Inlet hose is kinked. Be sure there are are no sharp kinks or loops in the inlet hose. 4 – Supply flow pressure is lower than 30 kPa (0.3 bar). Contact a plumber. Miele Dishwasher Error Code = The display shows the fault code F52. Cause Of Error/Fault Code = Sensor has detected excess foam suds in cabinet. The program is interrupted. 1 – Turn the selector switch to Stop/Finish. Light touch buttons press Start/Stop button for 1 second to stop LED flashing. 2 – Turn the dishwasher off and then back on again. 3 – If using detergent tablets that also contain rinse aid the Combi Tablet Program should be set. Don’t use detergent tablets with Quick wash 40°C program. 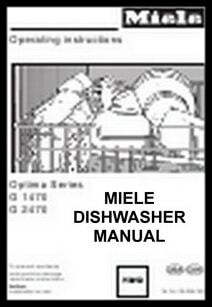 Miele Dishwasher Error Code = Middle spray arm blocked or Lower spray arm blocked. 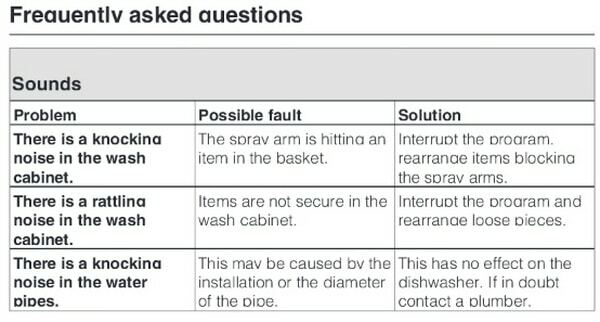 Cause Of Error/Fault Code = The middle or bottom spray arm is obstructed by dishes. 1 – Rearrange items to stop obstruction. 2 – The middle or lower spray arm water jets are blocked. 3 – Switch the dishwasher off. Remove the spray arms. Rinse under running water. Replace spray arms and check they rotate. Miele Dishwasher Error Code = Water intake temperature too low appears in display in without heating program. Cause Of Error/Fault Code = The water intake is below the required temperature of 45°C. 1 – Restart the program. Use another program if the error message reappears. Check water temp. Miele Dishwasher Error Code = Water intake Open stopcock appears in display. 2 – Water inlet filter is blocked. Clean the water inlet filter. 3 – Inlet hose is kinked. Be sure there are are no kinks or loops in the inlet hose. 4 – Supply flow pressure is lower than 30 kPa. Miele Dishwasher Error Code = Countdown time not shown in display. 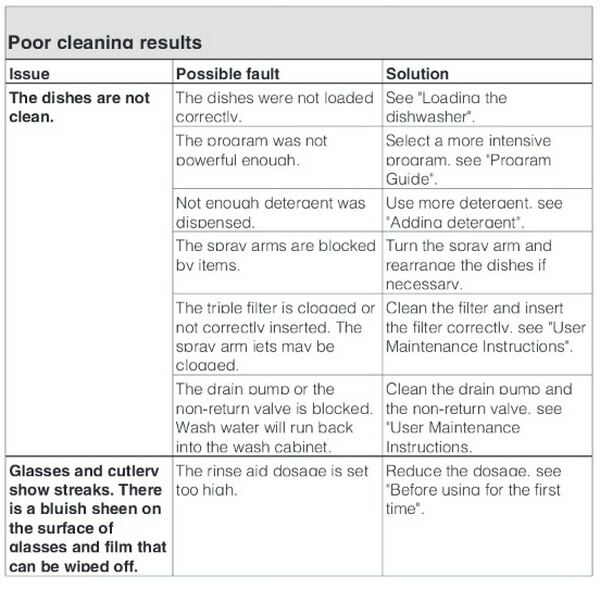 Cause Of Error/Fault Code = Depends on dishwasher model (See below). Some models have a 2-digit display which will only show delay start times. They do not show coundown times. 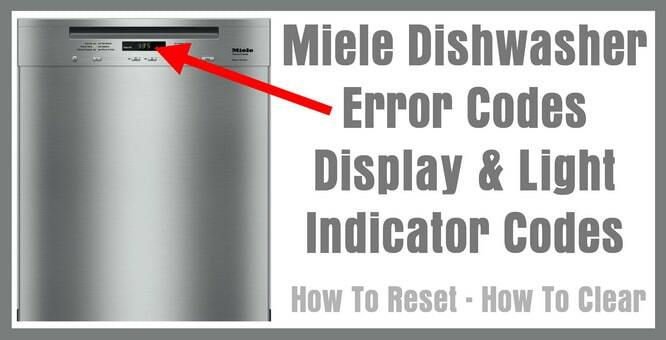 Miele Dishwasher Error Code = Message Fault F14 or Fault F69 appears in the display. Cause Of Error/Fault Code = The circulation pump is blocked. The circulation pump may stick or jam. 1 – Remove filter combination. Pour 1 liter of warm water with 3 to 5 drops of rinse aid into the dishwasher interior and soak for 5 minutes. Start the program. Repeat this step 3 times. 2 – Trun the dishwasher off. Switch the dishwasher on. Select the desired program using the program selector button. Press the Start/Stop button. Miele Dishwasher Error Code = The dishwasher display is blank. Cause Of Error/Fault Code = Machine stand-by function active. Display goes blank when it is switched on and no buttons have been pressed within the last 5 minutes. 1 – Press any button to bring up the display. 2 – To display the countdown time permanently, deactivate the Stand-by in operation function. 3 – On some dishwashers the display is only for the delay start function and they do not show wash time remaining. Miele Dishwasher Error Code = The display is blank, button sounds may be heard (G6900 and G6905 models). Cause Of Error/Fault Code = There is a problem or fault in the software. 1 – To operate the appliance disconnect the power supply for one minute. Then switch the appliance on again and deactivate either the time display or the Brilliant Light. Miele Dishwasher Error Code = The display is in a different language. Cause Of Error/Fault Code = Incorrect language setting. 1 – The language can be modified as a programmable function or from the settings menu. The flag symbol serves as a guide. Miele Dishwasher Error Code = The display shows Close salt container cap. Cause Of Error/Fault Code = The salt container cap is not closed tightly. 1 – Put the salt container lid on tight. 2 – If the salt container lid has become loose during a program cycle refasten then turn the dishwasher off and back on again. Start the wash program again. Miele Dishwasher Error Code = The display shows the fault code F70 (WaterProof system). Cause Of Error/Fault Code = The Waterproof system has been activated. 1 – Turn off the stopcock and contact Miele service. Miele Dishwasher Error Code = The display shows the fault code F78. Cause Of Error/Fault Code = A fault has occurred in the circulation pump. 1 – Turn the dishwasher off for 30 seconds. 2 – Turn the dishwasher back on. 3 – Select the wash program you want. 4 – Press the ‘Start’ button. Miele Dishwasher Error Code = Three horizontal bars – – – show in the time display at the end of the program. Cause Of Error/Fault Code = There may be a technical issue. 1 – Press ‘Start/Stop’ for 1 second until the Start/Stop LED flashes. All control lamps next to program buttons light up. 2 – Switch the dishwasher off using the ‘On/Off’ button. 3 – After a few seconds, switch the dishwasher on using the “On/Off” button. 4 – Start the program again. 5 – Press the “Start/Stop” button to start the program. NOTE: Despite the problem the dishwasher can still be used in all programs. But the water will not heat. Miele Dishwasher Error Code = Error message F32 appears in display and door is not closed. Cause Of Error/Fault Code = Appliance has automatic door closing. The fault may occur if the door is closed too fast. 1 – Disconnect the machine from the mains supply for one minute. Miele Dishwasher Light Indicator Code = Finish LED not activated at end of program, only Start LED slow flashes. Cause Of Light Indicator Code/Fault = Miele dishwashers have been optimized to comply with recent standby consumption legislation to reduce power consumption. Consequently the display and all LEDs are switched off (with the exception of the slow-flashing ‘Start’ LED) at the end of a dishwasher program. This is intentional and does not represent malfunctioning. 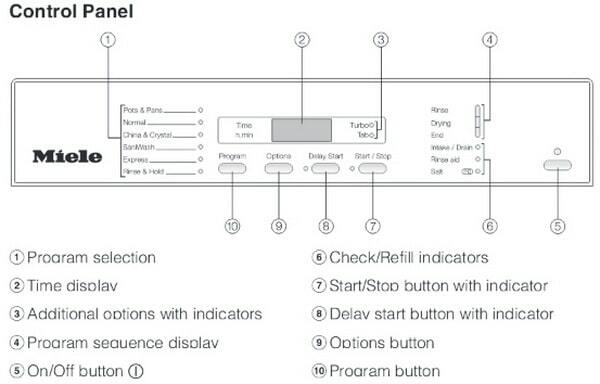 Miele Dishwasher Light Indicator Code = Water inlet indicator flashes shortly after starting a program. Cause Of Light Indicator Code/Fault = Stopcock is closed. 2 – Water inlet filter is blocked. Clean water inlet filter. 3 – Inlet hose is kinked or clogged. Be sure there are are no sharp kinks or loops in the inlet hose. 4 – Supply flow pressure is lower than 30 kPa. Check water pressure. Miele Dishwasher Light Indicator Code = Indicators do not switch off after last operation of controls. 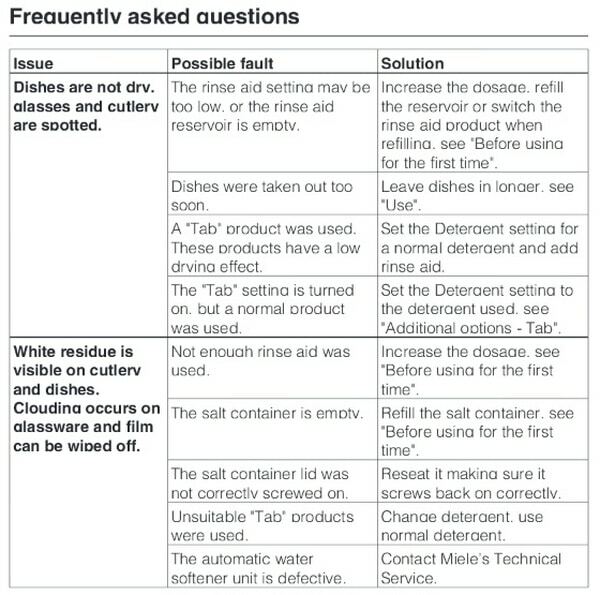 Cause Of Light Indicator Code/Fault = A program is still running or the indicator is showing the need to replenish salt or rinse aid. 1 – No remedy necessary. 2 – With the standby function switched on, indicators only switch off after completion of a program if there is no error to report. Miele Dishwasher Light Indicator Code = Rinse Aid or Salt (PC) indicator lights lit up. Cause Of Light Indicator Code/Fault = The ‘Salt’ indicator light may continue to be lit after replenishing the salt reservoir as it may take a while for the salt to dissolve. 2 – The light will go out on its own. 3 – Using Combi X-in-1 tabs. Miele recommends selecting the ‘X-in-1’ function. If this function is not available, the indicator will continue to operate as before. This is normal when using combi tabs. For the best drying results, Miele recommends that you use separate detergent, rinse aid and salt. Miele recommends adding salt and setting the water hardness to keep the built-in water softener in good working order. Miele Dishwasher Light Indicator Code = The Drain indicator light is flashing and the program has stopped. Cause Of Light Indicator Code/Fault = Fault during water intake drainage. Filter combination in cabinet is blocked. 1 – Clean filter combination. 2 – Something is blocking the drain pump. Remove the object. 3 – Drain hose is clogged or kinked. Straighten hose. Monitor any kinks as these may cause the plastic to become brittle and worn. 4 – Drain hose blocked. There may be a build-up of deposits in the drain hose. Check the hose for clogs and remove. Miele Dishwasher Light Indicator Code = The End and Start or the Start/Stop indicator lights are flashing at the end of a program. Cause Of Light Indicator Code/Fault = This is the standby function. 10 minutes after the program Finish LED has lit, the dishwasher switches to standby mode (Finish LED off, Start/Stop LED flashes slowly). This also occurs if a program has been selected but the Start button has not been activated. 2 – There may be a technical fault. a – Turn the program selector to the “Stop” position. b – Switch the dishwasher off using the “On/Off” button. c – After a few seconds switch the dishwasher on using the “On/Off” button. d – Turn the program selector to the required program. e – Press the ‘Start’ button. If the indicators flash again, there is a technical fault. Miele Dishwasher Light Indicator Code = The Spray arm indicator light is flashing. Cause Of Light Indicator Code/Fault = Large items are blocking the path of the middle spray arm. 1 – Interrupt the program and rearrange items obstructing the spray arm. 2 – The middle spray arm nozzles are blocked. 3 – Switch the dishwasher off. Remove the spray arm and rinse under running water. Replace the spray arm and check they rotate easily. Miele Dishwasher Light Indicator Code = The Water inlet indicator light lights up during the Energy save program. Cause Of Light Indicator Code/Fault = The intake water has not reached the required temperature of 45°C, the hot water system may be overloaded. 1 – Start the program again. 2 – If the indicator light comes on again select a different program. Miele Dishwasher Light Indicator Code = The indicator light Inlet/Drain is flashing, water possibly still in cabinet. Cause Of Light Indicator Code/Fault = Fault during water intake/drainage. Water intake problem. Soiling or blockage in the filter or non-return valve. 1 – Ensure the water supply is turned on at the stopcock. 2 – Check the water inlet filter and clean. 3 – Make sure there are no kinks or loops in the inlet hose. 5 – The drain hose kinked, blocked or not flexible. Straighten the hose. Miele Dishwasher Light Indicator Code = The Main wash, Drying and End indicator lights flash at same time. Cause Of Light Indicator Code/Fault = The dispenser was still wet when detergent was added. 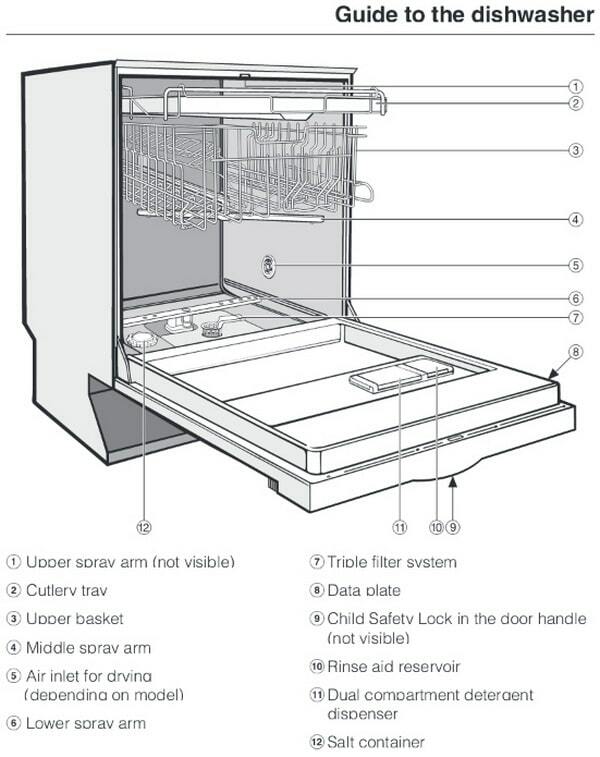 There are large objects in the lower basket in front of the dosage unit obstructing the water jets or the lid of the dosage unit. 1 – Be sure that the dispenser is dry before adding detergent. 2 – The middle spray arm is blocked. Switch the dishwasher off. Remove the spray arms. Rinse the spray arms thoroughly under running water. Replace the spray arms and check that they rotate freely. 3 – Load the front area of the lower basket with small plates so that dosage unit lid can open and the rinsing jets are not obstructed. Do you know of any other Miele Dishwasher error codes we have not mentioned or are you having trouble with your dishwasher? Please leave a question or comment below and we can assist. What us an f18 error on a miele dishwasher, it is the only code that I can’t really find any information about? I have technical fault F79 showing on my Miele G1832 SC dishwasher. Having set it to a programme and pressed start it bleeps rapidly and does not start. Have you any advice, please? The sensor wash on my Miele dishwasher used to be 1hr and 10 mins when we first got it. Three years later the wash time has blown out to 1 hr 50 mins. Could you please tell me how to reset the time back to the quicker time. The push button on my dishwasher does not work. It is recessed in, so I cannot use it. I couldn’t find error F79 which is showing in my dishwasher at the end of the cycle. The program is interrupted and the drain pump is operated. circulation pump and the electronic (SLT). F79 on G4720SCI MIELE Dishwasher Built In. On the same circuit as under-counter lights controlled by Lutron Caseta dimmer. Removed dimmer, Miele ran without F79. F51 fault code showing on my Miele dishwasher. Programme lights flashing and making a beeping noise – would be very grateful for any suggestions..
Miele inside lights lighting up , but the power button not lighting up or the programme s not lighting. 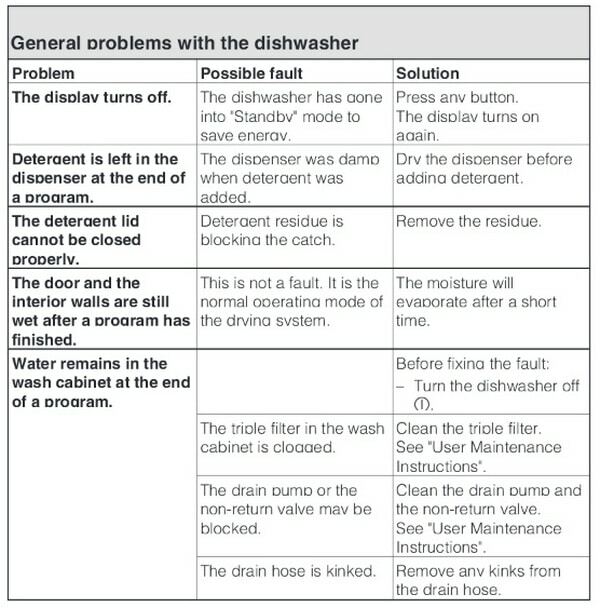 Dishwasher program selector buttons not responding, won’t move off of rinse/hold program. Does anyone know how to correct and change to another program. Buttons seem to be malfunctioning. Tried turning off, holding start button until it flashes, still does not change program. Miele G2180 does not start at all and simply has flashing “Normal” light indicator. Tried resetting to factory and unplugging. Any other ideas? I have found F04 error at my Miele Dishwasher G 7860 . Somebody can explain what that error mean? I couldn’t find nothing about. Please help me! it starts then stops after a few minutes? it starts then stops after a few minutes. What is it telling me and how do I correct it. Miele dishwasher G 851 SC Plus—serial # 27/64717055–type HG01——rinse light is always on –washer will not start—turn machine off and back on, push start and machine will empty, and refill with hot water. Miele dishwasher showing f4 or f14 fault code. Anyone know what these error codes mean? The level switch monitors the dishwasher’s water pressure during the heating cycle (main wash). Level switch failure can commonly happen from poor circulation, or from the defective level switch, itself. The most common reason for poor circulation is low water fill level. Check the water inlet assembly and the water level switch. I have a Miele dishwasher G7856. It gives me error code F3E. After a few minutes cycle stops. Check inlet pressure and filters. Check the pump and be sure it is draining. Something is clogged and causing the error. Cleaning or unclogging will remedy the error code. We have a Miele dishwasher that has come up with a F11 fault – it won’t drain properly. After removing the triple filter system and removing the excess water the machine goes perfectly well for another 3-4 cycles, then the F11 fault returns. So I remove the excess water and it goes again for another 3-4 cycles etc etc. Is it a fault with the pump or something that is easier fixed? 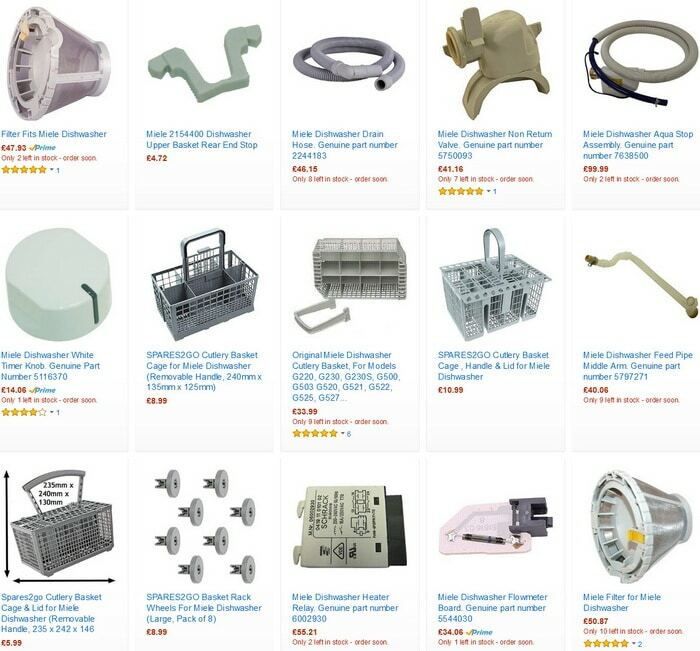 It sounds as if the drain pump in your Miele Dishwasher is “on the fritz” and needs replaced. If you have to keep removing the triple filter system to make it work, then yes the drain pump is likely the issue. There is nothing clogging the bottom to prevent the draining of the dishwasher? No, everything is clear and the impeller turns fine. I just have to take out the filter so that I can bail out the water. It then runs fine for several days before the same again. Had a new pump only 15 months ago! Then it sounds as if something is locking up intermittently. The start light is flashing after one hour left on a wash cycle. Miele Dishwasher starts ok and very quickly goes to E17 or 001. It’s only 3 years old. Can’t find this code anywhere. Coffee was spilt on top of the door of my Miele dishwasher. It now shows the wash/rinse/drying and end lights on all the time when you turn the dishwasher ON. The dishwasher turns on and makes a noise but does not work. If coffee got into where the control board is on your Miele Dishwasher, it may have fried a part of the board and therefore shows all lights lit when you start it. It may just be wet still and needs to dry out. Let it sit for a day or 2 and try again. If the same thing keeps happening, you will most likely need a new control board. Get the model number and find a new control board if you find that it is damaged from the spilt coffee. Is the error code showing F01 or you only see the number 1 on your Miele Dishwasher display? Did the error begin after the glass fell down in the bottom of the dishwasher? If you cleaned it out and the display will not respond… Try unplugging the dishwasher for 5 minutes to reset. Also, let us know the model number of your Miele Dishwasher if you still are having problems.